The Garden Club of Orange was awarded a $500 grant from the National Garden Clubs (NGC) PLANT AMERICA Community Project. The purpose of this grant program, an ongoing project of NGC, is to provide financial support for new or existing club projects in their respective communities across the United States. The application for the grant was submitted by Club members Patricia Dray and Maryellen Bespuda. 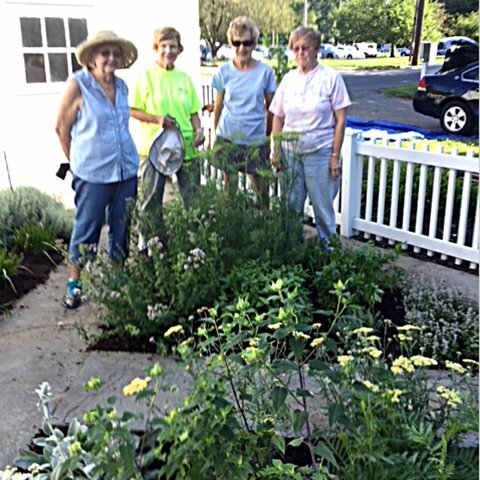 Beginning in 2017 The Garden Club of Orange in collaboration with the Orange Historical Society began the restoration of the herb garden at The Stone-Otis House. Using an original description of the garden provided by the Society, the Club cleared years of debris and added donated compost and improved the soil. Under the leadership of Maryellen Bespuda, Club members planted 31 types of herbs. They were divided into four quadrants – two of culinary herbs, one of beverage herbs and one of medicinal herbs. Historically correct plant markers were purchased with partial reimbursement from a grant from the Orange Lions Club Charity. The Town of Orange donated mulch and assisted with its placement. The $500 grant will be used to purchase and install a historically accurate bench and plants so that all members of the community can enjoy the sensory experience of the garden. Pictured above are (l-r) Joanne Friedrichs, Elly Torello, Marianne Bauer, Historic Gardens Chairperson Maryellen Bespuda. The Garden Club of Orange is a member of the FGCCT, NGC and NEGC. For membership information contact Joanne Friedrichs 203-795-4266.